“The best beach isn’t on Curacao at all, it’s on Klein Curacao, an uninhabited cay a few miles off the southeastern coast.” – Lonely Planet, Travelbook. Surrounded by spectacular coral reefs, Klein Curacao is a sunlit pearl in the Caribbean Sea, just off the coast of Curacao. This uninhabited island is about an 1,5-hour boat ride away from Curacao and holds an intriguing history, mystery and beauty on just 1.7 square kilometers! Explorers, sunbathing enthusiasts, snorkelers and divers will all really enjoy a trip to diverse Klein Curacao! Up to the 19th century the island was a paradise for breeding seabirds. Their excrement, called guano, fertilized the grounds, allowing vegetation to grow in abundance. However, when livestock farmers let their goats roam freely around the island, the once fertile land of Klein Curacao converted back into a dreary desert. In search of phosphate, a much sought after additive in the 19th century, the English mining engineer John Godden, stumbled upon the island in 1871. He discovered the island had a wealth of phosphate, due to the guano. Until 1886 over 90 tons of phosphate was mined and exported to Europe, dropping the islands sea-level and rooting out the seabird population. Onwards, the Dutch West India Company arrived on the island. It was the time of the slave trade. The DWIC brought many slaves from Africa to Curaçao, placing the sick in quarantine at Klein Curaçao, before letting the other slaves come ashore in Curacao. The slaves and crew members who did not survive the horrendous voyage were also buried on the island. 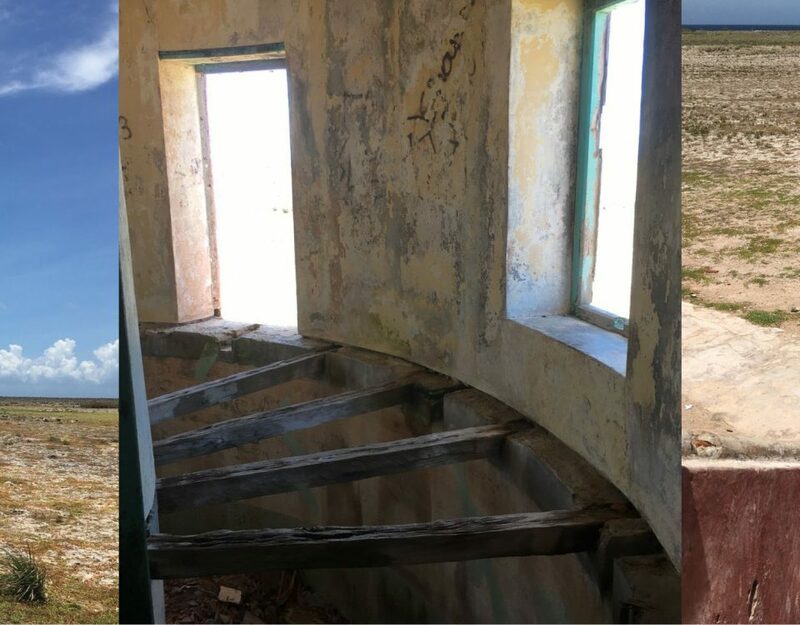 The remains of the first quarantine building and several graves can still be found on Klein Curacao. The Dutch West India Company was also granted permission to hunt the monk seal on the island, resulting in the extinction of the species. Through the ages, the now low, flat island was hard to spot from the bridge of a ship, resulting in not one but many noteworthy shipwrecks. In 1850, an iconic pink lighthouse was built, but got destroyed by unforgiving hurricanes in 1877. The second lighthouse was built in the interior of the island and still stands today. Despite the lighthouse and modern technologies, Klein Curacao is still a very difficult island to maneuver around because of the very strong currents and the unforgiving northeast winds. Most recent, in 1982, the large oil tanker Maria Bianca Guidesman stranded on the windward side of Klein Curacao, making it the island’s biggest shipwreck amongst another four or five boats and yachts that have also fallen victim to the island. Got intrigued? Want to discover Curacaos mystical paradise sister island? Hop on the Catamaran Black & White as we head out 4 times a week to this beautiful secluded destination. Departure is at 8:30 am, little later than the usual, so you have time to get up, have a bite – which can reduce the risk of seasickness - and meet us at Zanzibar, Jan Thiel Beach. The trip to Klein Curacao is about an 1,5-hour boat ride away from Curacao. Relax on one of the many sun protected benches, the open-air hulls or on the webbing. You will certainly get wet laying on the webbing, but you do have a front row seat here when it comes to spotting dolphins! 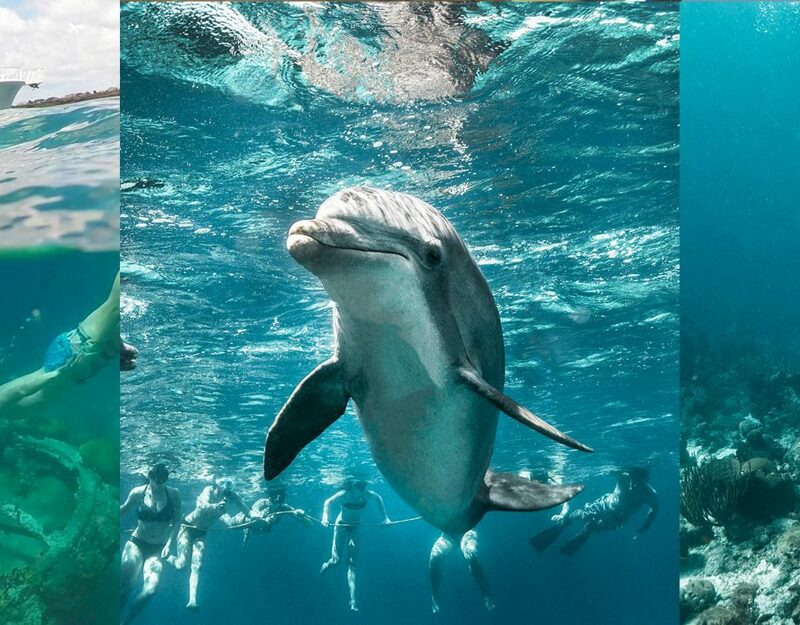 Dolphins quite often swim alongside the boat, playing in the waves and showing off their jumping skills. Somedays the trip may be wild and wet due to the waves and currents, but the reward is priceless! From far away you can spot the bounty sunlit island and its old iconic lighthouse. Upon arrival at Klein Curacao, the crystal-clear water is calm again, perfect for swimming, snorkeling and scuba diving. Although the dry way to get to shore from the catamaran is by dinghy, we recommend you grab a snorkel and swim to shore! Upon going into the water, you will immediately spot many colorful fish and turtles all around you! Between May and August, you may even see baby sea turtles making their way from the sandy beach into the clear ocean water. When you get ashore, explore the island while blissfully sunbathing along the way. The distance from the beach to the lighthouse, shipwrecks and ruins is not too far for a walk. Do put on your sunscreen and try to go there early as it can gradually get very hot in the middle of the island as the day progresses. At noon, the crew is ready to serve you up an extensive BBQ buffet, with items such as our tasty fall-off-the-bone BBQ Baby Back Ribs, BBQ Sausage, chicken skewer, succulent skirt steak, fresh pasta and kidney bean salad, bread and not to forget our famous homemade Dutch peanut sauce! Enjoy drinks from the open bar. Beer, wine, rum, whiskey, juices, soft drinks, water – we have it all! At 3:00 pm we set sail, waving goodbye to this Caribbean pearl and on the wings of the wind head back to Curacao. The way back is smooth as we sail with the north-east trade winds and current. Perfect conditions to kick off Captains Happy Hour!! Enjoy fresh fruit and your favorite drink in your very own BlueFinn cup – yours to take home as a souvenir! Watching the sun set, you cannot help but to reminisce on a beautiful day and awesome time at Klein Curacao. So much to do on such a small island! This will be the highlight during your stay on Curacao. Totally secluded with christal clear waters. Klein Curacao is considered one of the best diving destinations in the Caribbean Sea, thanks to its diverse and unspoiled ecosystem. The islands underwater world features everything from beautiful coral reefs, to drop offs, massive schools of colorful fish, and exciting underwater caves to swim through. For scuba divers of all levels Klein Curacao is a suitable destination. If you have your own diving equipment and tanks, you can take it all with you free of charge. Please just let us know in advance for storage space purposes. If you are in need to rent dive equipment, you can do so through our booking site and we will take care of the reservation for you. Our Dive Center Scuba Do, located on-site at Jan Thiel Beach, will take care of your medical form and equipment. The island is well suited for sun and sea lovers, but also hikers will surely enjoy a trip to Klein Curacao. By dinghy you can get to shore dry, so feel free to bring your best hiking gear and check out some of the sights. There is the abandoned lighthouse, a couple of shipwrecks, ruins and graves. Mostly the island is flat with very little vegetation for easy walking. Do put on sunscreen as it can gradually get very hot on the island as the day progresses. Klein Curacao is the ultimate kitesurf paradise, with steady offshore wind from January to September and waves coming in on both sides of the island. On the leeward side the water is calm, ideal to bump and jump, while more to the windward side of the island, the wind picks up, waves get higher, making it ideal for the more advanced wave riders. Note that Klein Curacao is an offshore spot, about an 1,5 hours’ boat ride away from the mainland and has limited safety (no official rescue boats), so it’s no beginner spot! If you want to go kitesurfing at Klein Curacao, you may bring your own gear with you free of charge, just let us know in advance for storage space purposes. Klein Curacao is pure nature. The only structures on the island are the old lighthouse, a private beach house and a couple of huts fisherman stay in when on the island. The beach is a half mile long stretch of pearl white, soft sand, ideal for sun bathing. We do recommend using sunscreens with a higher SPF as the sun can get very hot and unforgiving. You might not feel the intensity of the sunrays due to the cool sea breeze, but you will feel the result at the end of the day if you do not look after your skin properly. Please tan responsibly. Klein Curacao is well-known for its underwater beauty. You can easily get in the water and snorkel anywhere on the leeward side of the island. The best place for spotting turtles is - facing the shore from the boat - down the beach to the right. Here you can also swim straight out to the drop off, which is fairly deep at about thirty feet. Here you can spot bigger fish and down below some larger hard and soft corals and sponges. There is a more daring spot to snorkel, all the way to the end of the beach toward the left. This spot does come with a warning, because of the fairly strong currents coming around the tip of the island, creating an opposite current, pulling you out towards the tip of Klein Curacao. It is one of the best snorkel spots with excellent depths and visibility for a snorkeler, lots of colorful fish, a good variety of hard and soft corals and a drop off, but again, be very careful if you snorkel here that you don't get dragged out and turn back before you are tired. * This spot is not appropriate for beginner or weak swimmers. Please do not attempt to snorkel here without fins on your feet! (BlueFinn Charters does provide snorkel gear; however, fins are not included nor available for rent on the island. Please bring your own from the mainland if you are planning to snorkel at this spot). From smaller, private, motor boats to larger passenger ferry sized vessels, there are a few boat tour companies that can take you to Klein Curacao. 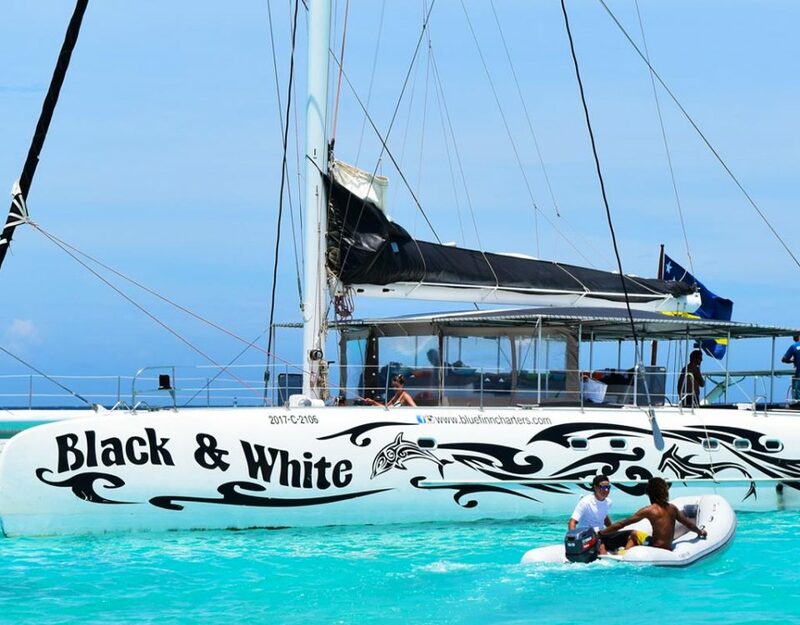 So why choose Catamaran Black & White? Although it’s not our policy to brag about ourselves, we are glad you asked! Catamaran Black & White is operated by BlueFinn Charters, a boating company with over 25 years’ experience in the (pilot) boating industry, where skills and safety is of utmost value above all else. Rest assured you are in safe and skillful hands. That said, Catamaran Black & White is brand-new, making it the newest, and at 75ft long, also the largest catamaran on the island of Curacao! On a more technical side catamarans in general favor other types of boats, because they have natural buoyancy, making them unsinkable. Seasickness is slim to none, because catamarans are very stable, have little to no heeling, and don’t roll at anchor. If you are prone to seasickness, our extra-large catamaran is definitely the way to go. Being a sailing catamaran you get to enjoy a 2-in-1 boating experience. On the way out, we travel by motor, on our way back to Curacao, we hoist sails and on the wings of the wind sail back to the mainland. On the fun side, the extra-large webbing our catamaran offers is unique to the experience! Hop on, get wet and watch dolphins swim along beneath you. But really making it all come alive, is the unforgettable crazy crew! One of a kind, full of energy and wittiness, they attend to your every need from the moment you arrive at the pier, all the way through puking, lunch, happy hour and beyond! They cook up a mean BBQ buffet and serve drinks crisp and cold all day long! They are the ones who made our Captains Happy Hour famous…! Come check out why! That’s our side of the story, but don’t just take our word for it! Review our flawless 5-star rating on Facebook and our 95% excellent rating on TripAdvisor. Catamaran Black & White heads out 5 times a week to beautiful Klein Curacao: Monday, Tuesday, Wednesday, Thursday and Saturday. Departure is at 8:30 am at Zanzibar, Jan Thiel Beach, where we return around 5:00 pm. The trip is all-inclusive: boat, snorkel gear, BBQ buffet, drinks and crew. You pay $109,- for this full day trip, children 4 to 12 years pay $55,- while younger kids (0-3 years) travel along for free. If you are looking for a more private experience for a group up to 6 people, you can also choose to charter our 38ft Sportsman Fishing Yacht Balkan. Please contact us for a personalized quotation if interested. Don’t hesitate! 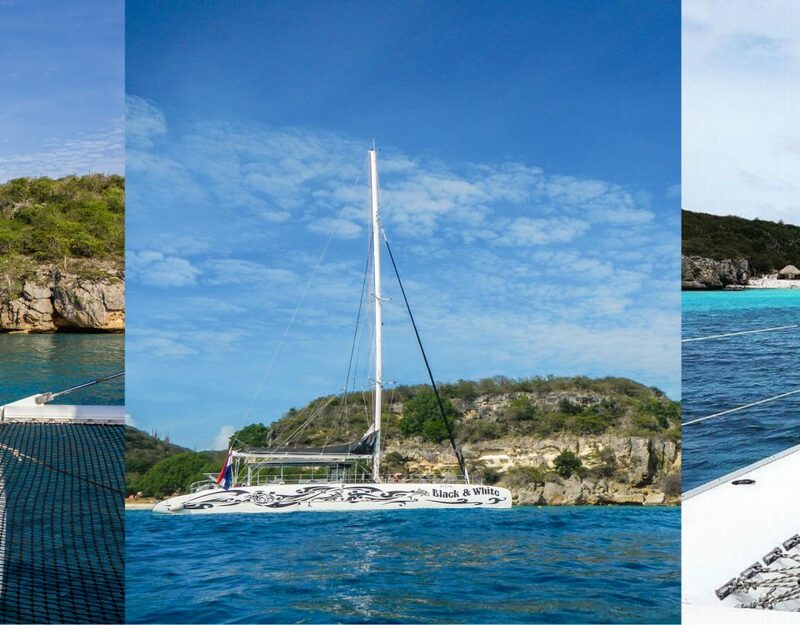 Step aboard the 75ft Catamaran Black & White and let Curacaos newest and largest Catamaran take you there!